Bruce(Bruce’s Dream) This big guy joined us in August of 2016. Bruce had eleven starts and won $315,024. He has settled well into the barn and has an easy time becoming best bros with whomever he is with in turned out. Old racing injuries may prevent him from being ridden a lot; but for now he is a funny, sweet, and talkative dude to have in the barn. Click here for Bruce’s Dream racing history. Cecil(Cee’s for Clever) Our grey dressage pony, Cecil, was born in 2004 and made a little over $110,000 while racing. This sweet dude can smile, bow, and count, but his real skills lie in the dressage court. 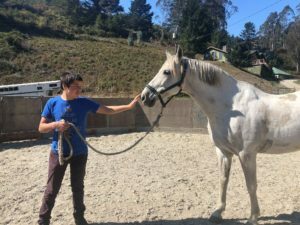 He is a fantastic mover and has found his niche helping peopledevelope their posting trot on the lunge line. 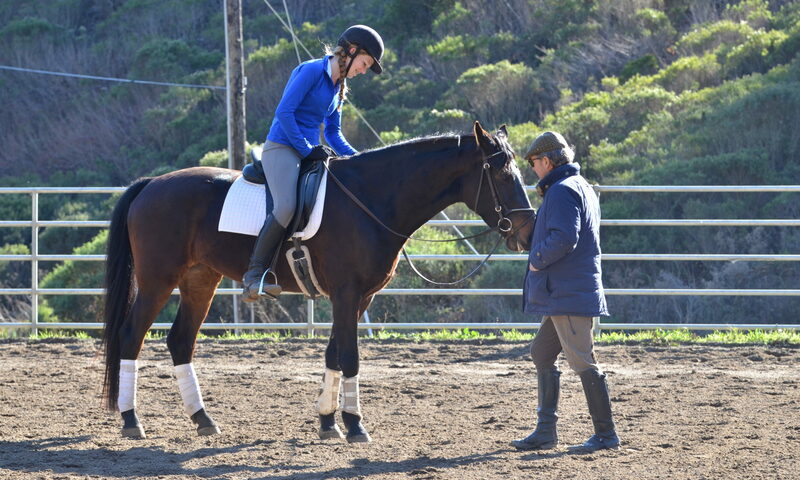 Cecil enjoys calm, attentive riders, and building relationships with his students. Thank you Geri Forrester for the continued support of Cecil. Click here to check out Cee’s for Clever racing history. 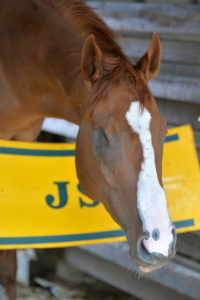 Classica Although Classica’s race history is somewhat of a mystery, we are very sure of one thing-–we love this horse! Owned by Dave Lawson, Classica has been used for polo, jumping, trail rides, and teaching lessons. We are so grateful to Dave for continuing to let us work with his sweet mare. 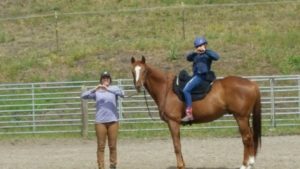 Classy keeps all of her students safe, and is the perfect horse for that slow, quiet trot so many of our kids want and need. Classica now lives at our Sonoma satellite facility, Cadence Farm. Thank you Dave Lawson for the use of your wonderful horse. Curtis(Extra Fifty) We are smitten with this monocled gelding! Curtis was involved in a pasture accident during his layup time and had his left eye fully removed. He is quirky, energetic, and loves to cuddle. His lack of an eye has yet to slow him down – in contrast he leads the craziness in turnout and has found a friend in Stanley. We enjoy seeing how this smart guy continues to learn. Click here for Extra Fifty’s racing history. Skiff Born in March of 2014 this sweet guy came to us in spring of 2017–too gangly and uncoordinated to be any success at racing. We turned him out with his buddy Triton for about 8 months, and when we brought him back in he had grown 4 inches taller and filled out into a handsome and handy little horse! We are so thrilled how smart and athletic this little noodle has become. He has been started under saddle and his sweet nature and can-do attitude tells us he will make a fantastic program horse someday. Skiff now lives at our Sonoma satellite facility, Cadence Farm. Hawkins(To the Bar) This leggy liver chestnut is ready to wow you on the trail and in the arena. 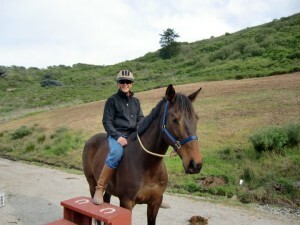 He wants to please and feels comfortable to ride english, dressage, and western, on the trail or in the arena. Hawkins walks into puddles for the fun of it, and is a dream to lunge. Already he is teaching the teenagers how to be patient and settle into an exercise to build trust and confidence in both horse and rider. This sweet dude is cool. Hawkins lives at our Sonoma satellite facility, Cadence Farm. If you are interested in adopting Hawkins please contact rebecca@everyonefits.org. Henry(Momotombo) Born in 2003, Henry made over whooping $110,000 on the track. He is coming along as a lunge-line and in-hand lesson horse. He has a huge heart and tries his best in every activity we throw his way. This big guy give kisses, makes farting noises with his lips and will answer your question with a nod. 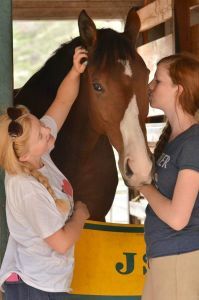 He is becoming a barn favorite with many of the teenagers because of his swinging walk, lifted trot and thunderous canter. 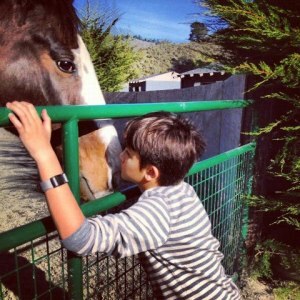 Henry now resides at Cadence Farm in Sonoma with Kyle. Thank you Geri Forrester for the continued support of Henry. Click here for Momotombo’s racing history. 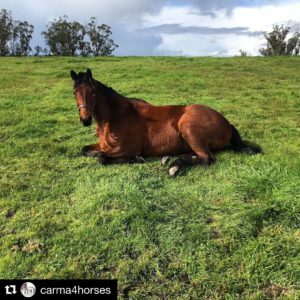 Hermes(Mythical Storm) Hermes raced in Southern California before heading north and ending up at Square Peg in late 2015. He has a great brain, wonderful build, and a curiosity to learn. Staff are in love with his dignity, attitude, and work ethic. His easygoing nature and intelligence have enabled him to be used in the program with huge success. The team is thrilled to have this gem for years to come. Hermes now lives at our Sonoma satellite facility, Cadence Farm. Click here for Mythical Storm’s racing history. Kyle(Cayambe) Kyle came the same day as Bruce in August of 2016. This massive iridescent horse was born in 2004, has 67 starts to his name, and won over half of a million dollars. Unquestionably sweet, Kyle and his half-brother, Henry have some similar quirks. We are looking forward to working with this huge copper fellow and seeing how he develops into a riding horse. 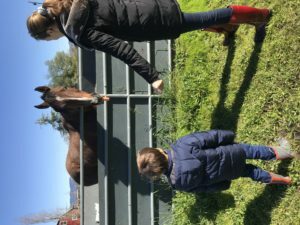 Kyle resides at our Sonoma location, Cadence Farm, with his half-brother Henry. Thank you Geri Forrester for the continued support of Cayambe. Click here for Cayambe’s racing history. 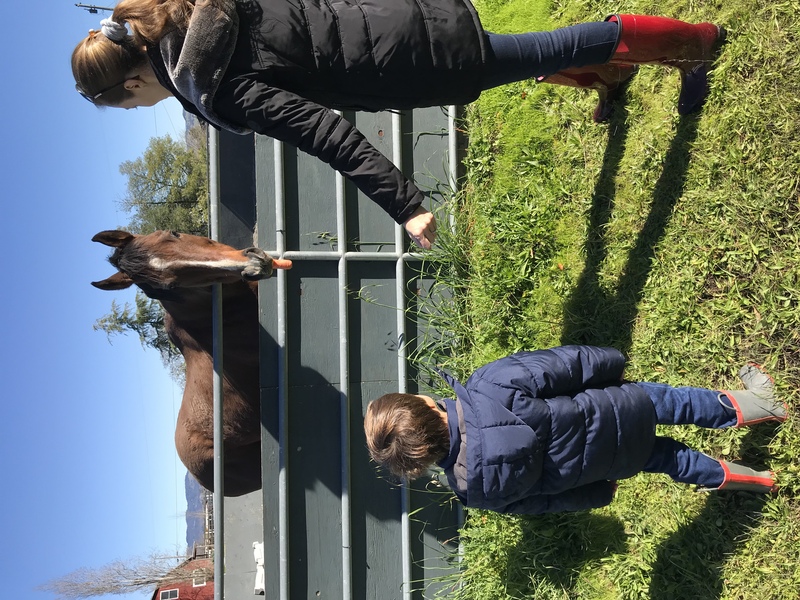 Mateo(Clever Royal) Mateo arrived at Square Peg Cadence Farm in February 2019. Sweet and gentle since day one, Mateo loves to roll, get neck scratches, and gently take treats from your hand. We have heard from previous exercise riders at racetracks that he was always a favorite to gallop. We look forward to seeing how this gentle guy settles into being a riding horse. Mateo lives at our Sonoma satellite facility, Cadence Farm. If you are interested in adopting Mateo please contact rebecca@everyonefits.org. Melville Melville is a big and handsome son of Street Cry—with a racing career to be proud of. While he is unable to be a riding horse due to injuries, he is smart and learning a ton of tricks while he is with us. We would love to find this personable dude a big green pasture to live in with some buddies as he gets along well with everyone. Melville lives at our Sonoma satellite facility, Cadence Farm. If you are interested in adopting Melville please contact rebecca@everyonefits.org. Mowgli(Escribano) Mowgli came to Square Peg in summer of 2016 from Florida. 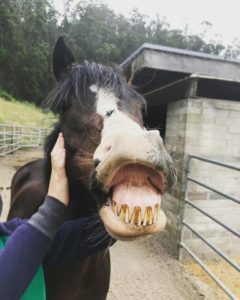 Originally from Spain, this gentle giant Andalusian decided that being a competition dressage horse was not in the cards. 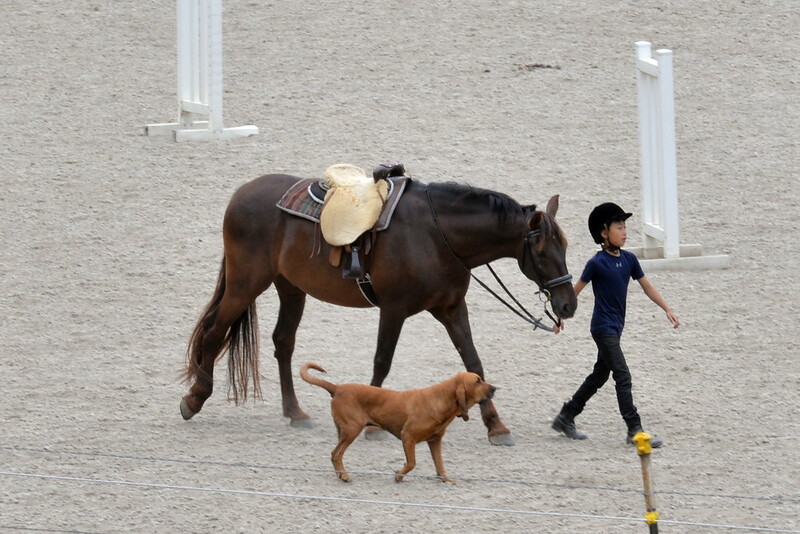 Mowgli’s inquisitiveness, smooth gaits and long back make him the perfect back-riding horse. A huge fan of snacks, trail rides, and rolling around in piles of hay, we are incredibly lucky to have this sweet horse in our tribe. We are honored by the Miner Foundation for the 2017 sponsorship of Escribano. Neil(ULuckydevil) Neil is the cutest creature ever. Constantly wanting snuggles this silly 2013 sweetheart will put the whole weight of his head in your arms if you let him. Having lost his eye as a foal due to infection, Neil sometimes needs to check his surroundings before he proceeds into a situation; and yet he barely blinks his eye when learning new skills. 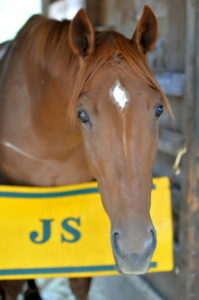 Staff are incredibly excited about his prospects as a lesson horse because of his chill, easygoing personality. Click here for ULuckydevil’s racing history. 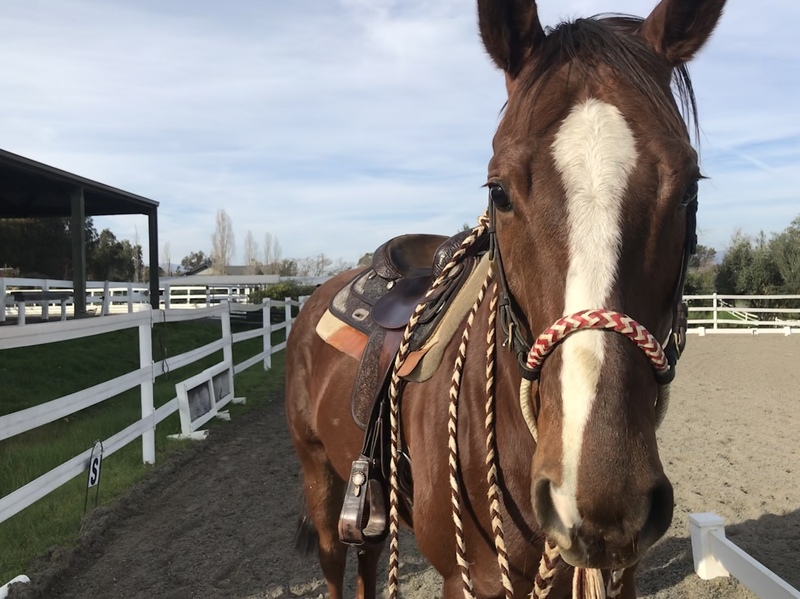 Phillip, Phils-y, or Phil, is an adorable 2002 retired hunter show pony. He is loving the change of pace as a member of the Square Peg herd. His small size and unflappable attitude ensure that he will be a successful pony for everything from longe-line lessons to trail rides for years to come. Moso(Ermoso) Moso arrived in California from Texas in May 2018. 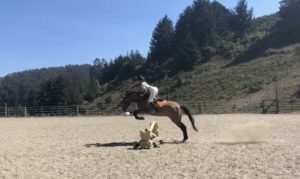 This pony-like Lusitano is motivated to jump! While well schooled in dressage, this dun baroque horse perks up and thrives off cantering straight towards a big vertical jump, and sending his short strong body flying over to the other side. 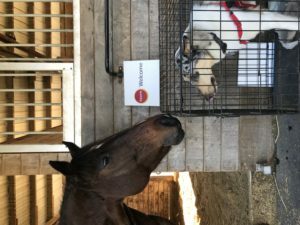 He is a ham and love to learn new tricks—already perfecting a bow and smile. 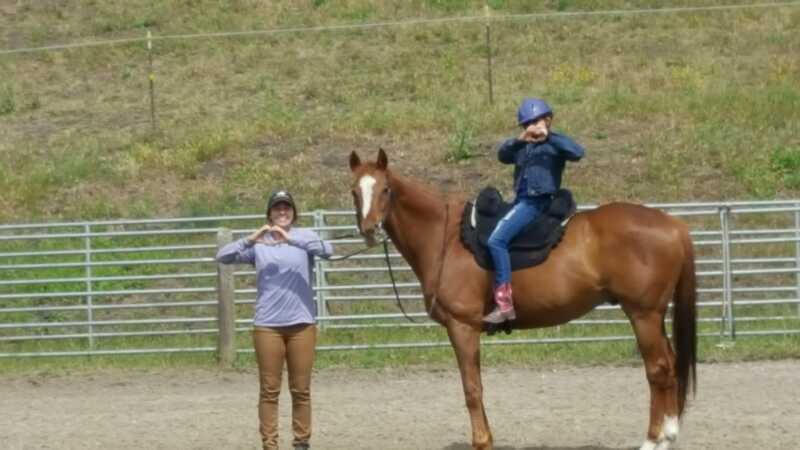 Staff are excited to teach and continue to learn more from this cute and quirky horse. Stan(Irresponsible King) This handsome son of Kingmambo loves to wow the crowd. 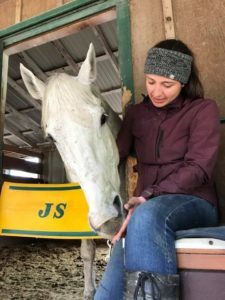 Stanly, a 2002 gelding, made $20,400 on the track but is much better suited as Joell’s partner in dressage, trail rides, and jumping. 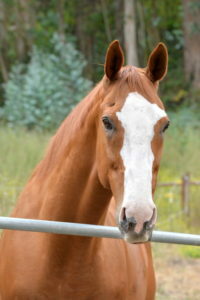 He’s our best “trick” horse and would love to show you how he can count, bow to the ground and stand on a pedestal. 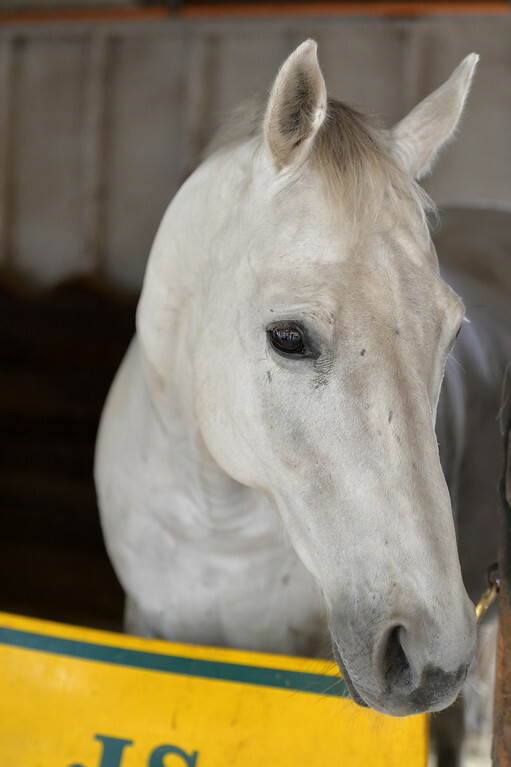 Stanley is the barn’s goofball and has a heart for everything—especially sneaking out of his stall. When he arrived at the ranch 6 years ago, he was suffering from a cracked shin and a chronic throat problem; there was a time that we weren’t sure he would make it through the winter. We sure are glad he did. He has now become one of our best dressage horses; schooling Piaffe and flying changes, and working on developing his passage and canter pirouettes. Click here for Irresposible King’s racing history. So happy to see my big boy Fifty has a great home. Thank you. What a wonderful program. I know they are giving great joy to people and children. God bless you for this sharing of horses with people and especially children.